The Dandy Warhols never sought wide acclaim, but they got it anyway and that is what kept them going for 25 years. The Portland, OR quartet peddle a particular brand of slacker psych pop that gained them a fan base that are willing follow them every where they go - even if it's a dead end of which there have been plenty throughout their career. Their latest album Why You So Crazy is a mixed bag of genres - hipster country for Highlife and Sins Are Forgiven, an Alex Chilton rip-off melody for Small Town Girls, joyous power pop for Be Alright , psych triphop for Next Thing I Know, novelty pop for Motor City Steel. They don't care if people appreciate their output, because they know their audience will have their back, no matter what. 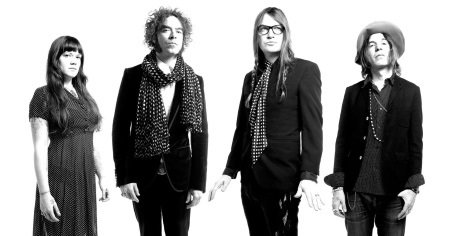 The Dandy Warhols are a marketeer's worst nightmare, but every now and then mainstream success will find them again. They will welcome the check, allowing them to keep doing whatever they want to. Why You So Crazy is released via Dine Alone Records.